Women's Wisdom Retreats are also available at your location. For women who want to embrace the inner wisdom of their feminine spirit and bridge the gap between nature, spirit, and the physical world of their body, relationships, money, work. Where? At Enchanted Lake ~ a place where the feminine spirit blossoms. 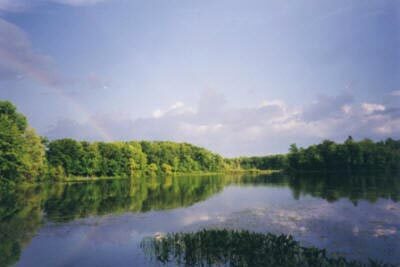 It is 35 miles NE of Grand Rapids Michigan at the home of Daina (Dinah) Puodziunas located on 40 breathtaking acres with a small private lake. Women's Wisdom Retreats are held from May to October. The May and October retreats will have a renewal sweat ceremony that brings us back into balance with the spiritual and physical inside of a dome shaped structure which represents the womb of mother earth. Sweat ceremonies have been done by people from many different cultures to reconnect with the earth and to rejuvenate. NOTE - This is not a Native American Sweat Ceremony. It is specifically designed for women to embrace their feminine spirit. 1) We first create an enchanted circle by using candles and sage. We place whatever we want on the alter. Sometimes we drum and sing (I have some drums and rattles available to use.) Universe means "One Song". When we make music together, our energies begin to harmonize and an enchanting space is created. 2) We open the circle by agreeing to commit to not gossip and to not talk about what anyone shares beyond this circle. We create a VERY safe and nurturing space. 3) We begin with a sharing circle where some of the women who have been to a previous retreat might share some insights, action steps, challenges, or anything that they are proud of with the circle. Those that are new can share what they are wanting for themselves at this time in their life and how we can support them. There is always a common theme that emerges as we are all sharing. I call this surfacing the wisdom of the group. 4) As the theme for the group emerges we will go out into nature and discover personal symbols in nature of animals, plants, elements etc. to open your intuition and insight. We will then gather back together and begin interpreting the personal symbols received using Ted Andrews "Nature-Speak Oracle Cards" and other exercises to access your inner wisdom. 5) Early evening we go out to create the fire for the renewal sweat ceremony. We might drum and sing outside while the fire is burning and while we cover the structure for the ceremony. 6) We will then go back to the house, snack some more, and get ready for the ceremony. 7) The ceremony - I begin to pour water over the rocks, pray, drum, use rattles as I create the energetic space for our renewal. You can get out at any time. We are all sitting around the pit in the earth that is filled with hot rocks. We also sing. Then I usually do guided inner journey that goes with the teaching earlier that day. You will also have time to say prayers of your own if you decide to do so. There is no pressure and you can remain silent. 8) After the sweat we often go into the lake to refresh and then back to the house for eating, sharing, laughing. You are welcome to shower as well. You will sleep like a fresh newborn that night and wake up renewed and refreshed!!! Please arrive between 12:30 and 1:00 PM eastern time. Bring a dish to pass that preferably does not need heating - this could be fruit, salad, sandwiches, dips and things to dip, some sweets - enough for about eight women. Bring some natural bug spray, a couple of towels you don't mind getting dirty, an old robe is great, some paper and pen, and a water bottle. You are also encouraged to bring a symbol of something that you want to empower in your life right now and a symbol of something you want to release. You will be able to place it on the little nature alter outside of the renewal sweat. This has really been meaningful to women when they bring it home with them and can stay connected with the energy. The renewal sweat ceremony takes place outdoors in the evening. It is a dome shaped structure with a pit in the center to hold hot rocks that are placed in there after we go in. Many women enjoy going in without any clothes as it is completely dark in there once the flap to the doorway is closed. I encourage all women to do what feels comfortable to them - bathing suit, towel, terry wrap...whatever. You are welcome to rent the Eco~spirit retreat camper/trailer. "I am shouting from the hilltops to announce my new found peace and clarity. I would never have imagined such a sharp focus existed!" "I have experienced subtle, yet profound shifts within the renewal sweat that opened me to the wondrous, ever abundant Feminine Heart." "I had the most amazing experience yesterday. I participated in a sweat lodge ceremony with four other women. It truly was like being in the womb of the great mother. The woman who facilitated it is such an old soul and a wonderful, light-hearted healer. She is not pretentious in any way. I know you would love her. When I got back to the house we went swimming in the lake, the half moon reflecting off the water. It was beautiful, the entire experience was. I am grateful that spirit led me to that place, I was ready to heal another layer. Again life has shown itself to be a grand adventure, full of twists and turns that I can never really anticipate." The June retreat is for women who are experiencing a restless need to find their life purpose and a desire to know what their gifts and talents are. We will use parts of the workbook: "The Four Gateways To Re~enchantment For Women" written by Dinah. The retreats are designed to help women "downshift their internal gears”, get fully connected with themselves (mind, body, spirit) and nature, and begin moving in the direction of their dreams, desires, and wishes. 4) Through a guided inner journey, sacred women's circle work, and ceremony you will awaken your inner wise woman. Dinah will guide you through specific exercises where you will discover some of your gifts and talents. 5) We will go out into nature and discover personal symbols in nature of animals, plants, elements etc. to open your intuition and receive insight. 6) We will then gather back together and begin interpreting the personal symbols received using Ted Andrews "Nature-Speak Oracle Cards" and other exercises to access your inner wisdom. 7) You will then create an "Authentic Soul Mandala" from what you discover to bring home. Bring a dish to pass that preferably does not need heating - this could be fruit, salad, sandwiches, dips and things to dip, some sweets, etc. We will munch throughout the day. Bring some natural bug spray, some paper and pen, water bottle, and clothes for the weather. All materials for your Authentic Soul Mandala will be provided. but haven't been doing it. but don't know how to stop. how much it's costing you. and feel alone, disoriented, or scattered. and don't know how to move forward. This retreat is designed to help women "downshift their internal gears”, get fully connected with themselves (mind, body, spirit) and nature. We will be using "The Four Gateways To Re~enchantment For Women" created by Dinah to help you learn how to turn change and challenge into a personal transformation and rebirth. 4) Through a guided inner journey, ceremony, and some exercises from "The Four Gateways To Re~Enchantment For Women" you will understand the cause of your "split energy" with one foot on the gas and one on the break and what to do about it. "You have really been a HUGE help in my moving forward after sooooooo many years of being stuck. That's why I keep encouraging other women I know to check out your workshops and support groups, I know that your Gateways work!" "I am grateful for all of Dinah's life experiences that brought her to this place, at this time. On her path she has learned to help other midlife women on our journeys, to help us find our way back to ourselves. She helped me realize that my authentic self had been there all along. I just had to remember how to listen to her, and then gave me the tools to do so." Create your own vision board and learn how to use your thoughts and law of attraction to manifest dreams and desires! The universe is a friendly place. It responds to our thoughts, intentions, and feelings about our desires. You will learn how to manifest your desires from the inside out. You will understand how to set your desires into motion and how to align with the law of attraction through creating your very own vision board to bring home. You do not need to be naturally creative. This is a simple collage of pictures and words that you then continue to use after you bring it home. We will use part of the workbook that Dinah created, "The Four Gateways To Re~enchantment" for this process. your energy with your desires. 6) You will then create a "Vision Board" from what you discover to bring home. All materials for your Vision Board will be provided. Please register here and I will give you directions and answer any questions. Daina "Dinah" Puodziunas - Ceremonialist, Life Coach, Professional Speaker, Workshop Leader, and Author has had her own personal development business for more than 20 years. She has studied with Debbie Ford, apprenticed with various teachers, and has studied metaphysics extensively.